by Karen J. Foli, Ph.D., and John R. Thompson, M.D. "My child will like me, attach to me, and learn to love me." There are many books that address the dynamics of the child's attachment and bonding, but few have explored how the lack of a child's attachment and bonding create feelings in the parents. These feelings can manifest themselves as confusion, anger, rejection, and deep sadness. Many parents believe that if they love enough, their child will reciprocate that love. Many times the child learns to respond, but there are also times when intervention is necessary. Your child comes to you with months, perhaps years, of learning how not to trust in others. Logically, you understand this; but if attachment is delayed, it can be nearly impossible for you to depersonalize this lack of attachment. It hurts. She turned to me and said, "You're not my mother anymore. I don't like you." I had just had it with her. I told her, "Fine. You'll give us our name back. You will not be a part of the family. You reject me, you reject the family." Then she tested that on my husband, whom I hadn't said a word to. She announced at the dinner table that she didn't want me as her mother anymore. He echoed everything I had said to her: she would give up the last name and not live here. We never heard another word about it. But she constantly tells me, "I don't trust you." I answer her, "I don't trust you either. You haven't earned my trust." At times, children will attach to one parent more than the other. This preference for your partner can be painful. You're torn between the relief that your child has been able to bond to another and feelings of being alone and confused because that person wasn't you. "My child will be as happy as I am." You've waited months, years for this child. The anticipation of finally welcoming your child home is filled with joy. Her room awaits her. You have painted, wallpapered, purchased furniture, and changed your life to make everything ready for this child. But wait. She looks so sad. She's crying. She's confused. This holiday was supposed to be so happy for the family. Why is your child sullen and unhappy at Halloween/Thanksgiving/Christmas/her birthday? Perhaps you thought things were going well. Your child had adjusted and her behavior had improved dramatically. Now, suddenly, she is exploding again, acting inappropriately in public, and crying for no reason. You're lost and wondering what is going on. Anniversary responses to placement or other traumas can trigger unexpressed sadness in your child. She probably doesn't understand it herself and acts out the way children do -- through behavior. In some cases, she may have been placed so many times that she has lost track of those specific events and focuses on birthdays and holidays, traditional family times, to express how she feels through her behavior. Your child may also come into your home with some chronic levels of stress and depression, feelings that are rooted in years of struggle. Responding to her past environments, the child has coped by using skills that were appropriate to that setting; yet behavioral changes (responses to perceived threats) could not alter her stress, depression, and anxiety (generalized fear). If your child is older, she comes with a past that is one of the most significant influences on her present ability to feel and enjoy happiness. The joy of childhood may have been, at best, interrupted; at worst, that joy never existed. All human beings have basic needs in order to sustain life: oxygen, water, and food top the list. But there is also the need to feel safe. A chronic lack of feeling safe may be at the root of your child's inability to live a happy life in her new family. 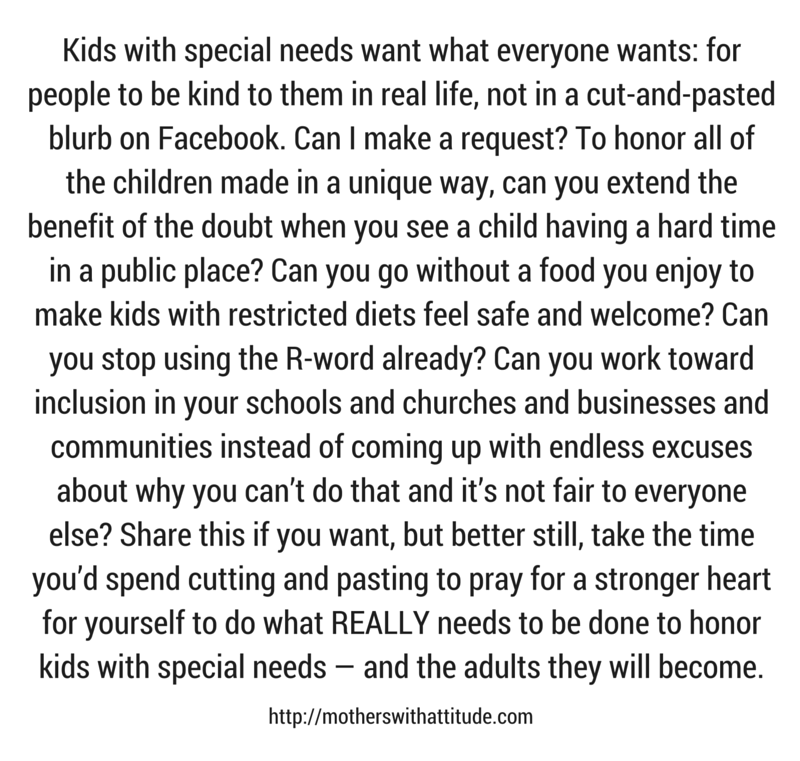 "My child's needs will be the same as those of other children." There are a multitude of parenting books that teach us about development and the "normal" milestones of children. As we've discussed, with time you will understand what needs your child may have. Multiple placements and damaging caregivers can leave a child with multiple and complex behaviors -- behaviors that overwhelm you, frighten you, and fill you with a sense of hopelessness. But what about the tea parties? What about throwing the ball in the backyard? As with any child, adoptees need to be kids. Their play is their work. That's what they need to do, despite other needs that may exist or develop. The evaluations by experts, the hours of therapy and tutoring, on top of just keeping a household running, can make us forget that playing is important to the child and to you. When you play, the child begins to know you. You are reminded of why you wanted to parent and of the joy parenting can bring. Yet there may have been so many disappointments, so many celebrations gone wrong. Perhaps your child has accused you of horrible acts. Your resentment builds upon your anger. The child takes on the persona of a saboteur. A cycle forms. You become defensive when planning special events, anticipating that your child may act out. All of your strategies have failed up to this point. And on top of the anger, you feel helpless to change your behavior or your child's. At times, you don't think of your child as a child. You forget that underneath the hurt and detachment, there is a young soul. You can't get past your anger to try again. You feel a stalemate has been reached. Yet the status quo doesn't seem to make anyone very happy. You wonder where is the happy family you envisioned. You know your child needs something, but you aren't sure anymore what those needs are, or where to find help to meet those needs. You know your needs as a parent aren't being met, either. Where has the laughter, the lightheartedness, and the solidarity of the family gone? "My child's story is our family's story." Photograph albums now include a new face ... a new child ... your child. She is part of you now and is making family history along with other family members. But her history is different. She will need to make sense of it. Her peers and the public she is exposed to will ask questions of her and she will need answers for them. Reprinted from "The Post-Adoption Blues: Overcoming the Unforeseen Challenges of Adoption" by Karen J. Foli, Ph.D., and John R. Thompson, M.D. (August 2004; $14.95US/$21.95CAN; 1-57954-866-0) © 2004 by Karen J. Foli, Ph.D., and John R. Thompson, M.D. Permission granted by Rodale, Inc., Emmaus, PA 18098. Available wherever books are sold or directly from the publisher by calling (800) 848-4735 or visit their website at www.rodalestore.com.